We were first introduced to Libs Elliott’s work at the latest PechaKucha Toronto event. 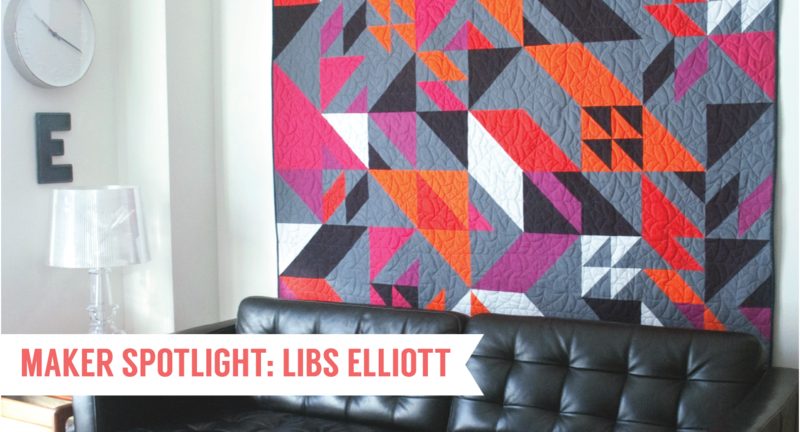 Instantly blown away by her work, which uses generative code to create incredible quilt patterns, and inspired by her belief that everyone should be a maker – we knew we had to hear more of her story. Tell us a bit about your background and how you came to design. I studied photography and material art and design at OCAD back in the 90’s but then changed direction and took on a career in the advertising industry. I spent over 12 years project managing web and print projects but really missed the satisfaction of having a creative outlet. So, I took several quilting classes at The Workroom and I got hooked. I didn’t have much interest in making quilts from patterns other people had designed so I started designing my own. Throughout my career in advertising, I’ve met a lot of people in the design and technology community. My husband, Hugh Elliott, would speak at conferences so I’d go along and meet all these people who were creating amazing work with code. Joshua Davis was one of those people who blew my mind. We’d become good friends over the years and he was into doing a collaboration after seeing some of my mad quilt skills. 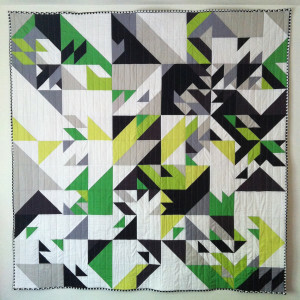 So, using his code, I made the first Processing quilt in 2011 and knew immediately it’s what I wanted to keep doing. So here I am! What drew you to generative design in particular? Combining generative design with textiles just makes sense to me. The random aesthetic is so visually pleasing, you get lost in it. And I love not knowing exactly what the sketch will look like until it comes up on the screen. The Processing code I’m using allows me to design quickly and come up with compositions that my brain just couldn’t do on its own. 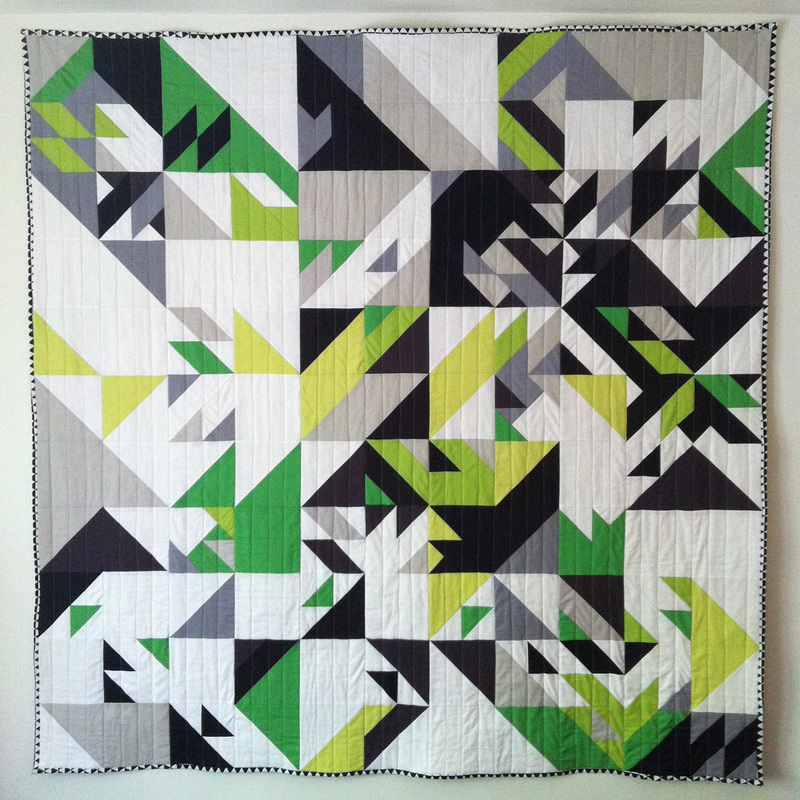 How have the traditional quilting communities reacted to your work? I’m honestly not sure what most traditional quilters think or if they’re familiar with my work. I’ve had a lot of positive response and support from contemporary quilters, which is great. I’d like to think that anyone who quilts would appreciate it purely from a skill standpoint, even if it doesn’t jive with their aesthetic. That’s the way I look at quilting – I know how much work it is so, no matter what it looks like, I’m going to be impressed with the effort the maker put into it. Your work is at the intersection of technology and traditional craft, have you encountered other examples of how these two worlds are working together successfully? I’ve seen some really interesting craft and science combinations happening, like crochet versions of DNA, membranes and bacteria. Anna Oguienko, who is also local to Toronto, has made some beautiful pillows, prints and a quilt from her Processing designs. 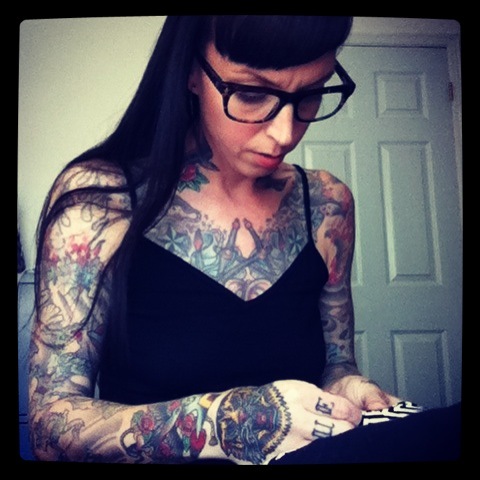 And she’s built a mesmerizing generative App. We’re doing coffee soon to have a mind-meld! There are also some great workshops out there being run by places like HotPop Factory, that combine use of laser-cutters or 3-D printers with handmade projects. What does your process look like? How do you approach a new project? I almost always start by opening up Processing to experiment with colours and the ever-increasing bank of shapes I’ve been making. Often, I’ll spend quite a while just playing with colours and trying to decide what I’m in the mood to commit to. This could mean staring at hex values, piling up my fabric swatches, flipping through photos of graffiti or saying “F*ck it!” and defaulting to black and greys that I love so much. Once that’s sorted out, I play around with shapes – scale, rotation, weighting. I like making fairly large sketches so I can select just a section of the composition to work with for the final quilt design. Finding a little gem within a sketch is one of my favourite things – Bingo! Then I open the sketch up in Illustrator and manipulate the design further until I’m ready to make it real. Then, I make a chai latte. And the rest is the typical, very methodical and soothing quilting process of cutting, piecing, sandwiching the layers, quilting them together and binding the edge. All of which takes several weeks. Then I climb underneath and have a nap. What are the biggest challenges of the work that you do? Right now, it’s time and balance. It takes a lot of time to make one quilt so I’m always looking for ways to be more efficient. Also, while I’m working on one, I’m already thinking about what I want to do next. I’m usually making more than one quilt at a time, plus trying to find time to experiment with new ideas and learn more, so I have to prioritize. It’s a juggling act where all that project management experience definitely comes in handy. Do you have any advice for someone who is just starting out as a textile designer? Work hard to find your style but don’t be afraid to experiment and go out of your comfort zone. Network with the craft and design communities to find support for your ideas because most people love to share their knowledge and want to help you succeed. Set goals and give yourself deadlines to accomplish things. You mentioned in your recent PechaKucha talk that you think everyone should be a maker on some level – why do you think that’s so important? When we’re kids, we are always making stuff. Imagining, building, getting messy and just pumping out loads of ridiculous stuff. We do it because it’s fun and fluid and we can say “I DID THIS!” Unlike some things, that feeling doesn’t change when you grow up. There’s instant pride in making something whether your 2 or 42. It requires problem-solving: What will I use? How will I make it? An it requires longer periods of concentration – which is sparse these days, given all the instant gratification we get from our devices. So it forces you to slow down and focus, which is a good thing once in a while. And, finally, the things you make have personal meaning because you’re leaving your mark. They will always hold value and stories that are superior to any mass-produced product. What can we expect to see from you in 2014? Is there anything we didn’t ask that you’d like to share? Don’t waste your time on things you don’t enjoy doing. Take chances. Have fun. It’s never too late to re-invent yourself and it’s worth the risk, because you only live once. See more of Libs’ stunning work here.